Ancelma’s story is one of several detailed in a series of reports urging Wells Fargo to break ties with private prison operators. In September, National People’s Action and the National Prison Divestment Campaign exposed that the bank was heavily invested in two major such companies with nearly $100 million of holdings in Geo Group and nearly $3 million in the Corrections Corporation of America (CCA). The groups launched a public pressure campaign, branding the bank “Jails Fargo” and holding demonstrations outside its branches. In late October, they declared victory when Wells Fargo’s most recent SEC filings revealed that it had divested more than a third of its holdings in GEO Group. Demonstrations held across the country yesterday targeted Wells Fargo, GEO headquarters, and the hedge fund Scopia, which according to Enlace holds over 9 million shares in GEO group. 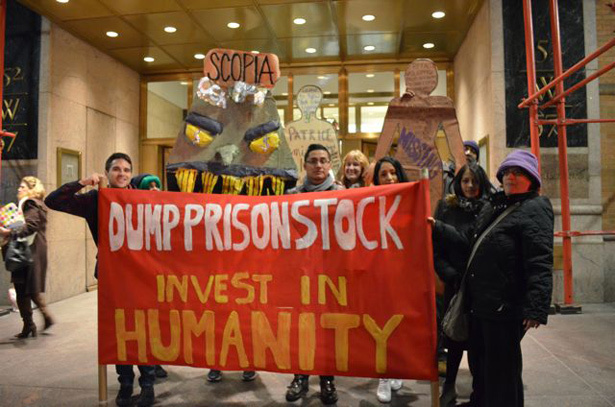 As New York demonstrators assembled outside Scopia’s offices, protesters carried life-sized black silhouettes labeled “missing” to symbolize the destruction of communities wrought by rising levels of detention.